Sunday was unorthodox but historic for the Greensboro Grasshoppers. Taylor Braley walked two over five innings and combined with Jeremy Ovalle and Michael Mertz on the club's first no-hitter in more than six years as Class A Greensboro beat Kannapolis, 2-1, in the opener of a doubleheader at Intimidators Stadium. "It's been a strange few days," Grasshoppers pitching coach Mark DiFelice said with a laugh. "We got rained out four straight games, so we've been just kind of in limbo. Yesterday was the first day we'd gotten on the field and then we played three games in a 24-hour span. It's been tough." Making his first appearance for Greensboro since June 13, Braley (5-5) established the tone early by retiring the side in order in the bottom of the first inning and working out of a jam in the second. The Marlins' sixth-round pick in last year's Draft sandwiched walks to Craig Dedelow and Evan Skoug around back-to-back strikeouts. 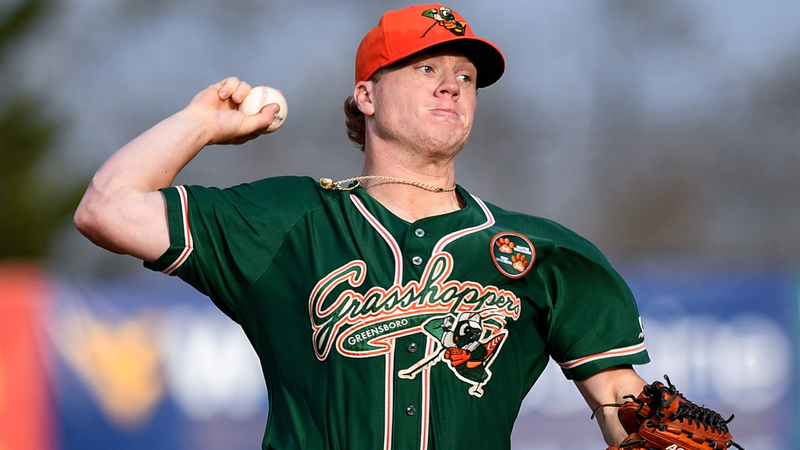 "We had just gotten Taylor Braley back from Florida," DiFelice said of the starter, who suffered a shoulder injury in a fall and made two starts in the Rookie-level Gulf Coast League before rejoining the Grasshoppers. "He was stretched out, so he was only scheduled to go about five innings for us, five innings or 75 pitches, and he went five innings and 66." The second free pass was Braley's last miscue. He got Ramon Beltre to line to right field to end the second, starting a streak of nine batters retired. After Beltre reached on an error by third baseman Marcos Rivera, the 22-year-old right-hander finished his day by getting Justin Yurchak to pop to short. "From the beginning of the season, he's always had pretty good command of his fastball at the bottom of the zone, the ability to move it around the plate to all quadrants," DiFelice said. "He just kind of lived up in the strike zone today and he got a lot of weak contact." Braley extended his scoreless streak to 11 innings over three starts and lowered his ERA to 4.28. The Intimidators mounted an unconventional rally in the sixth. Trailing, 2-0, and facing Ovalle, Ian Dawkins drew a leadoff walk and Luis Curbelo was hit by a pitch. Two outs later, Tate Blackman walked to load the bases and Mertz issued another free pass to Tyler Frost to force home Kannapolis' lone run. Greensboro's strange week may have had a hand in its relief corps' struggles. "These guys coming out of the bullpen hadn't pitched, some of them, in seven or eight days," DiFelice said. "Just gauging how the control was going, we could tell Jeremy was getting to the point where we needed to relieve him with the bases loaded with Michael Mertz. [Ovalle] was able to get us two outs, walked two guys and hit a guy. Mertz comes in, walks the first batter he faces, walks in a run, next thing you know it's 2-1, strikes out the next batter to end that inning and then puts up a clean seventh for the no-hitter. "It was very strange, but a great experience nonetheless. I don't think any of those guys had ever been part of a no-hitter before." In the seventh, despite issuing the Grasshoppers sixth walk with one out, Mertz finished off the milestone by fanning 27th-ranked White Sox prospect Luis Curbelo. It was the Grasshoppers' first no-hitter since April 23, 2012, when Jose Fernandez went six innings and combined with two relievers on a 6-0 win over Hickory. "They've been battling all year," DiFelice said. "At this level, it's a huge learning experience, and I always preach it's not about how you start, it's how you finish. It's learning along the way, and at this level, we preach fastball command and pitching off the fastball. A lot of those guys were able to do that today, and the secondary stuff, I think from the time off, is where they fell into a situation where they weren't able to command it as well. The fastball was still there and we got that in the first game of the doubleheader. Guys were able to command the fastball very well. "From a coaching standpoint, we just wanted the 'W.' The no-hitter was great, but I think coming out of there with the win was even better." Isael Soto gave Greensboro the lead in the fourth with his second homer in three games, then provided some much-needed insurance with an RBI single in the sixth. Kannapolis nearly matched the effort in the finale, allowing two hits in a 9-0 romp.